Enjoy a local show plus wine and cheese! 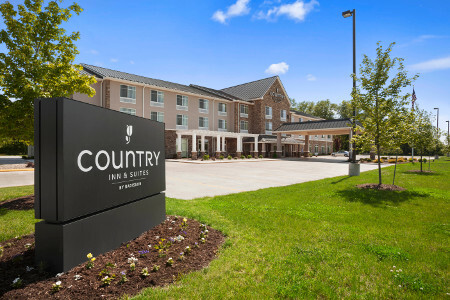 Located just off I-77, the Country Inn & Suites® by Radisson, Dover, OH offers a convenient place to stay when you want to experience Amish Country. Our spacious rooms feature Amish-crafted furniture, and we lie within 30 minutes of Yoder’s Amish Home and Coblentz Chocolate Company. You can also drive 15 minutes to browse the stores at Historic Zoar Village or tour the log buildings at Historic Schoenbrunn Village. 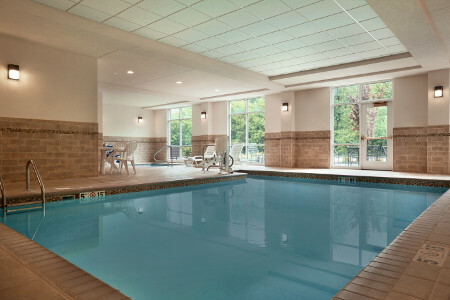 For a romantic getaway, book the King Whirlpool Suite, which features a two-person whirlpool tub and a plush king bed. 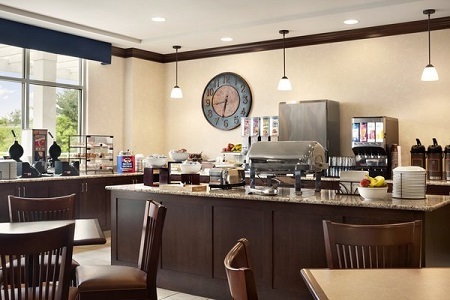 We serve our free, hot breakfast until midmorning so you can sleep in during your vacation. Choose from a variety of hot and cold items like waffles, muffins and cereals. For lunch or dinner, try the slow-roasted barbecue at Hog Heaven or an Amish home-style entrée from Dutch Valley. Numerous other dining options can be found a short drive from our hotel. Historic Zoar Village – Considered one of the most successful communal settlements in American history, Zoar Village offers you the opportunity to admire early American architecture in a charming, tranquil setting. Drive just 10 miles to learn about the German settlers who built this community in 1817. Dennison Railroad Depot Museum – Drive about 20 minutes southeast to this attraction, home to railroad exhibits, the Whistle Stop Railway Shop and Lucille’s Restaurant. Among the themed railroad cars are the Children’s Interactive Railroad Car and the WWII Military Hospital Car. Amish Country – Enjoy a self-guided driving tour or a guided group tour into Amish Country, about 30 minutes away from the hotel. Discover working farms, restaurants, and shops where you can buy handcrafted home goods, chocolate, cheese and works of art. 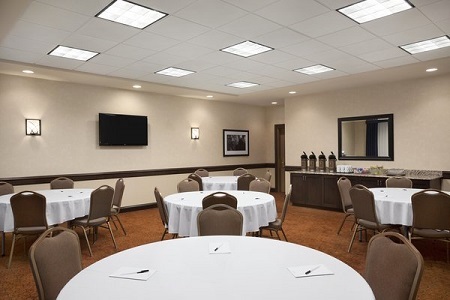 If you need a venue for a business meeting or family gathering of up to 75 guests, consider booking one of our meeting spaces. We offer a boardroom, a conference room and our breakfast room, all with free Wi-Fi and audiovisual equipment for effective presentations. Credit card payments are required at check-in; cash payments may be made at check-out only.